For the most part, it is actually easier to start a project from scratch than to add to an existing kitchen or try to fit a pre-set showroom display into a new space. However, sometimes even creating a kitchen design from scratch can be challenging if the space doesn’t offer much flexibility. I think the winner for the most difficult kitchen design project I ever worked on was a historically significant home located in Washington, DC. The planning and construction phases were lengthy due to the special permitting process required for a historic home. The exterior of the building could not be modified, so we had to work within the space we had been given over 150 years ago. The kitchen was located in the basement of the house, as they were back in the days the house was built, and thus came with very low ceilings and little natural light. 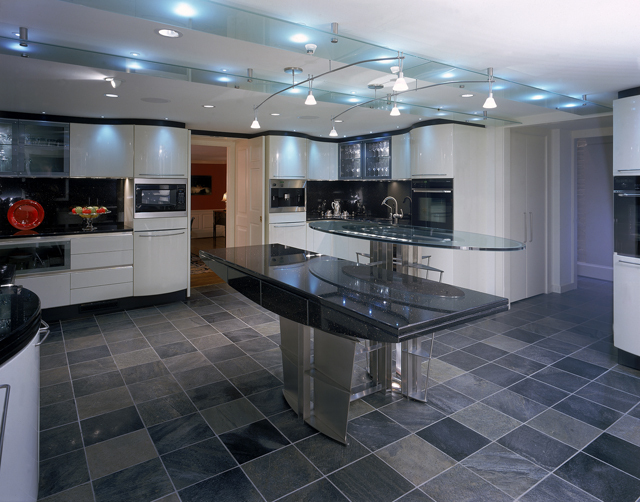 Unlike most challenging spaces, this room was actually very large, but that only contributed to making the ceilings appear even lower and the functionality of the kitchen slightly more awkward. 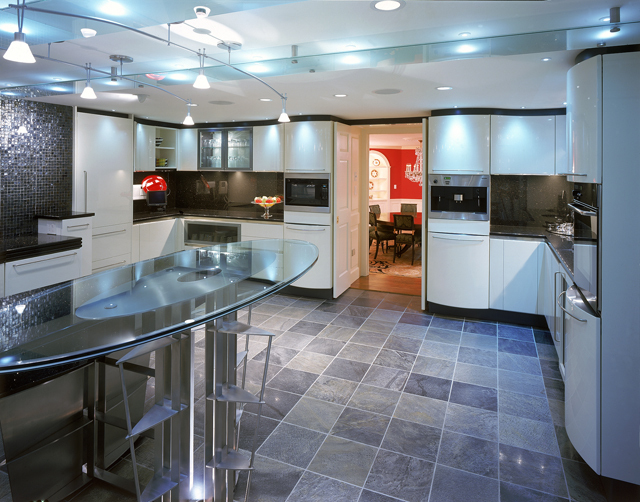 We chose high gloss white cabinetry and other reflective finishes like glass and mosaic tiles to help reflect the artificial light, making the space seem brighter and more open. Since there was no hood on the market that could accommodate the low ceiling height and the varying cooking elements that were required, we got a custom made hood from Abbaka. My clients were eager to embrace the juxtaposition between a very modern kitchen and the period furnishings throughout rest of the home, yet we couldn’t totally disregard the vernacular of the architecture. The curve of the Snaidero OLA cabinetry the clients selected lends itself to some traditional design elements, where cabinetry would be pulled forward to emphasize a focal point. However, more needed to be done with the design to create harmony between the style of the cabinetry and the surroundings. I raised the height of some cabinets and lowered the height of others to create a more traditional rhythm around the room. Playing with height and depth provided additional design elements without sacrificing the sleekness of the cabinetry. The white high gloss finish and the graceful undulating lines allowed the cabinetry to almost become part of the architecture, rather than calling attention to juxtaposing styles. The clients did not cook themselves but needed a multi-purpose kitchen to perform well for a large team of caterers, yet function just as well if a single person was preparing a simple meal. They were also adamant about not including a huge central island that would overcrowd the space, even though the large space demanded a central location for prep, landing space, and casual meals. I broke the design down into quarters, with the main sink and island remaining central, as a sort of functional ‘home base’. Each corner of the large square room provided its own work station, allowing chefs and wait staff to stay out of each other’s way, while also creating an efficient space for quick and simple meal prep. The goal was that no matter what activity you would be doing – standing at the cooking surface (which also included a secondary sink for filling pots and draining water), chopping fresh vegetables, preparing drinks or coffee, or heating something in a microwave – you would never be too far away from home base. After numerous cabinet designs were proposed for the island, the architect designed a steel structure to support a large granite countertop with a glass breakfast bar which allowed you to see through the entire kitchen without sacrificing the necessary counter space. It was exactly the design feature this kitchen needed to make it extra special. 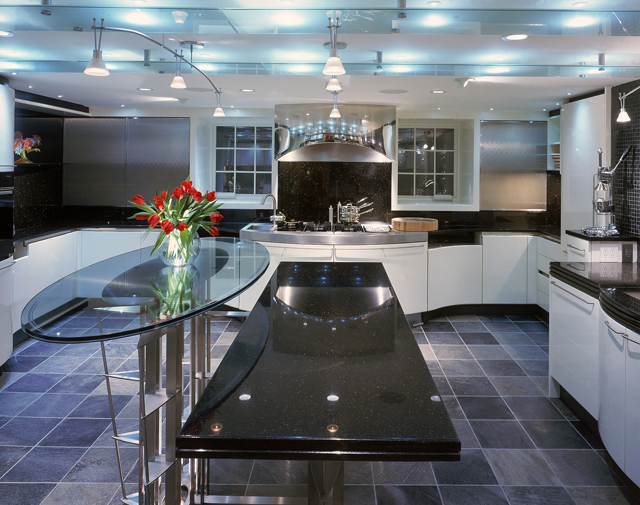 The kitchen design needed to take into account existing elements that could not be moved. A large electrical panel took up an entire corner of the room and, per code requirements, we were not allowed to put anything in front of it that would project out more than 12”. This meant that we could not use standard depth cabinetry, though, aesthetically, we needed to maintain a certain symmetry around the cooking surface/wall hood. In addition, the existing kitchen had the original brick hearth that the client wanted to bring into the 21st century. While the central location was perfect in the 1800’s, it posed a problem in a modern day kitchen layout. For the electrical panel, I had to be creative altering the depth of the cabinetry to avoid interrupting the graceful curve of the kitchen. Anything in front of the panel needed to be removable, so instead of standard wall cabinetry in this corner I had glass shelves made, which were cut in the same concave shape of the OLA wall cabinet and could be easily removed if someone needed to access the panel. As for the brick hearth, I turned this historical design element into the backdrop for the ‘home base’, honoring its emphasis within the kitchen. I centered the main sink/clean-up zone on this wall, which we clad in shiny iridescent Bizzaza tiles. The curved wall interior of the hearth complemented the curved front of the OLA sink base unit perfectly. Looking at the completed kitchen, you do not notice the issues that posed challenges during the design, and I feel that contributes to the success of the project. I think back about this kitchen design whenever I am faced with a special challenge that seems impossible to solve, to remind myself that there is always a solution…getting to it may just take some patience and creativity. In fact, the best design ideas often come out of having to work within particular limitations. Ultimately, that is part of the fun!